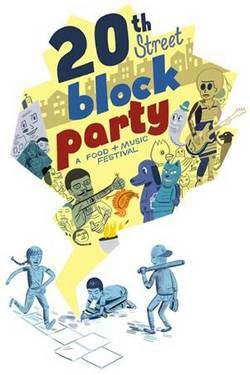 The Noise Pop festival is coming to 20th Street in the Mission on Saturday August 24th, with its ~20TH STREET BLOCK PARTY~. The event features food from local merchants, and this is 20th Street, so that means Flour + Water, Central Kitchen, The American Grilled Cheese Kitchen, Rhea’s Deli, and Trick Dog, plus beverages from the Bon Vivants, Sightglass Coffee, and Benders. In addition to the neighborhood’s vittles, catch live music from Two Gallants, Mac DeMarco, and Quinn Devereux and the Blue Beat Revue. The event is free and family-friendly, and you are encouraged to bring your party shoes. There will also be a workshop tent with craft projects, and performing arts happenings from Z Space. The event takes place from 12pm-6pm. 20th St. between Harrison and Bryan, and Florida between 19th and 20th Sts. On Saturday evening, from 6pm-10pm, don’t miss the Dark is the Night After Party at ~MISSION DISPATCH~. Look for drinks from Derby Cocktail, food from the likes of Phat Thai and the Burr-eatery, and live music. Entrance is $5 at the door, all ages welcome. 1975 Bryant St. at 18th St.